Ugh. In Arizona it’s soooo hot in the summer but also other parts of the year! The AC’s been working overtime all month, and your electric bill is skyrocketing. The kids are cranky, turning on the stove is almost unthinkable, and the whole family’s uncomfortable. If you have a built-up roof like many Arizona homeowners, there is something you can do to improve your home’s energy efficiency and improve your family’s summertime comfort. Coating your flat roof is one of the most significant things you can do to improve your Arizona home’s energy efficiency and integrity. When your roof is properly coated by a licensed, professional roofing company, it can provide more comfort for you and your family and protect your home against costly and unwanted future damage and repairs. Generally, your roof should be recoated every four years, as the long as the roof structure underneath is in good condition. If your roof coating is showing signs of wear and tear – cracks, fissures, wrinkles that can become cracks or fissures, chalking, and other signs of age – you should have your roof coating checked away. Once your roof coating is compromised, it is susceptible to damage caused by torrential monsoon rain and wind and more likely to deteriorate and leak considerably faster than intact roof coating. The quality of your roof coating makes a big difference in how long it will last and how efficient it is. 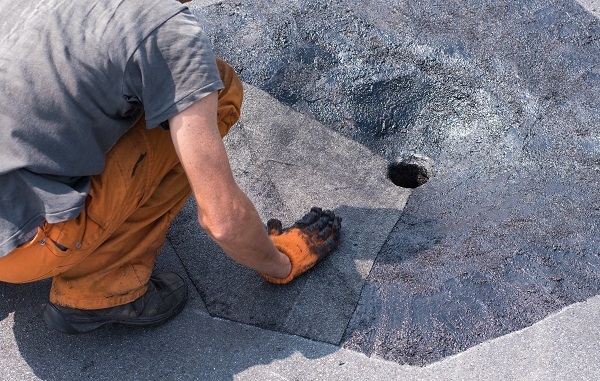 Tony's Roofing uses modified bitumen roofing, which is a high quality, durable type of roofing made from rolls of modified asphalt that are reinforced with polyester, rubber, or 3-ply fiberglass. The best coatings for Arizona roofs are white. Many roof coatings are initially black, then painted white. Plain white paint over a solid black roof coating is better than leaving it black in the Arizona sun since black roofing absorbs the intense UV rays and can actually make your home feel hotter. At Tony’s Roofing we use white or tan paint. Tony's Roofing goes one step further to protect your home from the elements and help you save on energy costs. Tony's uses the full line of professional quality APOC products and Tucson Rubberized Coatings, including reflective white roof coatings that meet ENERGY STAR® standards. Tony’s Roofing is a licensed, professional roofing contractor that has been serving Tucson and the surrounding area for more than 10 years. Tony’s crew can come to your house, take a look at the condition of your roof, and give you a free estimate. We will expertly apply your roof coating, generally in one day. Tony’s Roofing can do emergency roof repairs if your roof has started leaking or otherwise been damaged by storm conditions and other hazards. If your home has been damaged by weather or other accidental, environmental factors, your homeowner’s insurance policy may cover all or part of the damage. Check your policy to find out what is covered under your insurance. Tony’s Roofing is fully licensed, bonded, and insured, and will match any other licensed contractor’s quote. Don’t wait until your roof’s age is showing. Call the experts at Tony’s Roofing today for a free consultation. Copyright © 2019 Tony's Roofing, LLC.